Southern France research centre with its praised architecture. Saint-Paul de Vence, the top tourist attraction in the area. Do not miss this fascinating village with its many top gourmet restaurants and shops. Near this place you may also find the magnificent art museum Fondation Maeght. 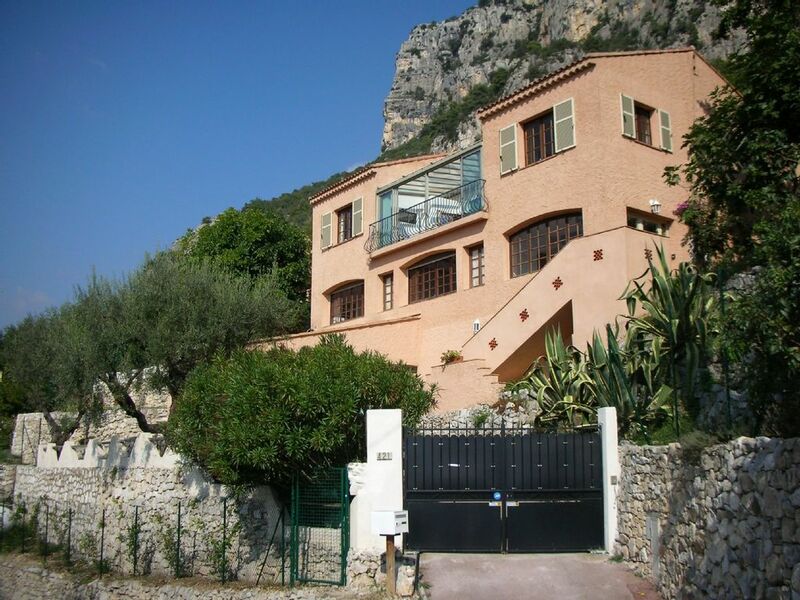 road to Vence exhibits marvellous views of the Côte d'Azur and the Mediterranean Sea. In Vence you find Chapel Rosaire, the museum for Matisse. Cannes, the famous city of the film festivals is situated only 30 km from the villa and Nice, with its famous harbour, beaches and charming old city is only 20 minutes away. Activities in the area: Golf near St Jeannet may be found in the Var valley and at Mougins and other places. At least 18 excellent golf courses are available near by. Mountain walking and even rock climbing is possible on site. Skiing in winter is only 1-1,5 hours away, for instance at Isola 2000. Rafting, canoe and hydrospeed are activities, which may be found in the Var and Tinee Valleys. More information: For further details about the superb holiday villa at St. Jeannet please contact the owner and/or his own website. Anne Marie and Hans Janus here sitting on the terrace in their rental home in St Jeannet. Their primary home is a little north of Copenhagen. Hans has a Phd in physics and has been a business executive in Denmark for many years and Anne Marie has an MA degree in languages. She has been teaching and part of her life she also was active distributing high fashion clothes from Italy to the leading fashion shops in Scandinavia. For many years we had been travelling in Italy and Southern France. Finally we focused on the French Riviera which we found having a fantastic selection of possibilities regarding tourist sites, nature and picturesque villages together with all the entertainment in Nice, Monaco and Cannes. Swimming in the Mediterranean Sea all year round and only one hour drive to the nearest ski pist in winter were also adding to the choice. We then made a strategic document describing everything we wanted for our future villa regarding size, location, orientation, number of rooms, pool, view, distance from the airport, walking distance to a charming village with restaurants etc. After intensive search the villa-st-jeannet was found to fulfil all the wishes and it was purchased in 2003. The villa in St. Jeannet is situated just outside the charming medieval village, and every morning it is a fantastic experience to walk up to the baker's enjoying the magnificent views over the French Riviera all the way. Sometimes a visit to the butcher's is also part of the stroll. He has the best meat possible including that of his own lambs in the surrounding mountains. Morning coffee and the lunch are enjoyed on the terrace by the pool, and in the evening the outdoor kitchen is the base for grilling the meat and vegetables. Sometimes the meals are enjoyed in one of the village restaurants or in the old city of Vence nearby and sometimes visits are made to one of the many art museums or the markets in Antibes. In case you need exercise, a walk to the top of the 800 m Baou just behind the villa will certainly make you fit. After that a relaxing stay by the pool makes you think life is just worthwhile! There is also an outdoor shower near the pool as well as there is an out-door kitchen with a gas grill and seating in French style Iron furniture. Telephones are available for free use to fixed lines in France and 70 other countries. The villa is fully air conditioned wih temperature individually controlled in al living and bedrooms. All linen and towels are provided and included in the rent. The washing machine is placed in the laundry room which is exclusively for the renters use. The tumble dryer is placed in the laundry room which is exclusively for the renters use. In the livingroom. Wood is supplied free of charge. The parking is within the electrically controlled gates. There is a double garage. One place, however, is occupied by the owners car. Comfortable seatings for 12 persons. The studio livingroom has additional seatings for 4-5 persons. Coffee makers and electrical hot water kettles are available in both kitchens. Dining table with seating for 10 people in the livingroom and a similar table and seating in the indoor glass veranda near the pool. In the studio a TV with French channels is available. DVD players are abvailable both upstairs and in the studio. Some board games and playing cards available. Outside is a private boules court for the use of the guests. A range of primarily classical CDs are available. A range of DVD movies are available. The garden is terraced on a sloping ground. One of the terraces has a boules court. In the garden there are many fruit trees incl. lemon, mandarine, figues and avocado. The bicycles have 18 gears and are free of use for the guests. For rent at the coast 10 kilometers away. Skiing area in winter is one hour away by car. Isola 2000 is 1.5 hours away. There are 18 golf courses within 30 - 45 minutes from the villa by car. The pool is for the exclusive use of the guests. It is 4m x 8m and 2.4m deep one end and 1.2m the other end. An insulating cover is available for extension of the swimming season to May-Oct. Heating and air conditioning can be individually controlled in all living rooms and bed rooms Completely equipped for 10 people incl. flat screen sattelite TV, DVD player, refrigerator, ice machine, deepfreezer, washing machine, tumbledrier, 2 dishwashers, microwave furnace, gas grill, barbecue, garden furniture and 4 bicycles. Free high speed Internet access. Further more there are sunbathing areas at the pool, double garage and parking inside the locked gates. Wonderful villa with good space and everything you need for a nice vacation. The view is panoramic. If you rent a car it´s possible to visit many wonderful places in the area. We visited fantastic citys and beaches. Some evenings we used the barbecue in the garden and it was very nice. A swim in the pool when the sun sets is also something special! Air con throughout. Good pool with outdoor dining space as well as conservatory with dining table next to kitchen which we used all the time. St Jeannet (which is a lovely and picturesque village) was a (fairly hot) 10 min up-hill walk in the morning to the boulangerie, and a much more pleasant 5 minute stroll down-hill back from the restaurant (there are 2 or 3 decent ones) in the evening. A great week - thanks you Hans. This spectacular property is as advertised and more. It does have stairs and it is uphill to the village but felt these quite manageable. Our group of college friends has been gathering on and off for 45 years and this location was certainly the favorite. We especially appreciated all the different types of common spaces this holiday home offers for visiting, dining and just relaxing. We took advantage of the proximity to St. Jeannet, walking in every morning to the delightful markets and selecting our provisions for the day. Freshly baked bread, croissants, locally prepared deli items, area cheeses and of course neighborhood wines were all available. Views out over the Côte d'Azur were spectacular as well as views of the Baou of St. Jeannet behind us. This large rock formation could be seen all over the area and acted as a beacon guiding us home at the end of each day. Owner Hans Janus was always willing to answer our questions (before and during the visit) and even called once to see how we were getting along. Caretakers Annette and Rick met us on arrival to review all the home's features, pool security, and tell us about the area. One highlight of the trip was Annette's suggestion to contact the owners of The Frog's House in St. Jeannet and inquire about local day trips. Roads, like many in France, are narrow and winding so finding out about local tour options was very appealing. Led by the charming and knowledgeable Frog's House co-owner Benoit, we hiked, visited Tourrettes Sur Loup, picnicked at a local goat farm, tasted St. Jeannet wines in the nearby winery, spent a morning in old Nice-dining on local tapas and toured home that afternoon on a incredibly scenic drive above Cap Ferrat and Villefranche-sur-Mer..... We highly recommend this property. The perfect villa for our family reunion! In a beautiful setting close to a charming village. We were fortunate to meet the owner, Hans, who showed us around the very clean villa. The road up to the villa was fun albeit challenging! Hans kept in good contact prior to our visit and replied promptly to any questions we had. The villa is situated conveniently just an hour or less away from attractions e.g. Vence, St Paul, Cannes, Antibes, Grasse, Nice, Monaco, etc. We shopped in the supermarket (which had all we needed) and also in the little village (bakery, butchery, fresh produce market, etc) - we catered ourselves for breakfasts and dinners so can't recommend any restaurants in the area. Would definitely confidently recommend this lovely villa to family and friends. My family and I had a wonderful 4 week stay in this extremely well-equipped and well-appointed Villa. We were met by the friendly, local, English-speaking caretakers who ensured we had everything we needed. The views from the Villa were breathtaking and a constant source of pleasure from either the Winter Garden or from beside the pool. It was a short walk to the authentic, ancient village of St Jeannet with its baker, butcher, farm shop, restaurants and bar and a 10 minute drive to the larger town of Vence. We would thoroughly recommend a stay here to anyone! Thank-you Hans for letting us stay! We have stayed at the house in St Jeannet two times (2012, 2014) and we are going there a third time. That in itself is testament to the quality of the property and the reliability of the landlord and the house manager (no hidden charges, things get fixed quickly if something stops working etc.). The house is well-situated, within walking distance of the restaurants in the village of St Jeannet. Within a few minutes driving distance there is a well-equipped supermarket, petrol station, boulangerie and pharmacy. The house is spacious (our company has consisted of 4 adults and 3 kids), clean and well-managed (nothing is broken). The pool is good, which is important for the kids. The kitchen is well-equipped and next to the terrace where at least we have enjoyed most of our meals. All in all, this is a superb house for anyone wanting to stay in St Jeannet for a week or more. The charming medieval village St. Jeannet is located 400 meters above sea level at the foot of the Baou St. Jeannet about 14 km fron Nice Côte d'Azur International Airport. From the village and the villa there are panoramic views to mountains and to the Mediterranean Sea, which is only 12 km away. Vence, town of 15.000 inh., having medieval charm, markets, squares, restaurants, shops, sights, art museums, churches etc. is only 5 km (bicycle distance) from the villa. Golf: There are 18 golf courses within 30-45 minutes by car. Please visit the owners own website. Prices are all-inclusive. Electricity, final cleaning etc. are included. The rent is payable online through HomeAway, by transfer to the owners bank in France in € (Euro) or by Credit card. A deposit of 25 % must be paid within 8 days from the date of booking and the remaining amount is to be paid with 25 % no later than 8 weeks and 50 % no later than 4 weeks before the start of the rental period.